March has been a good month for books. Let me give you a quick run down of the books I’ve read this month. Eldest: the second installment of The Inheritance Cycle. Brisingr: The third installment of The Inheritance Cycle. Inheritance: The fourth and final installment of The Inheritance Cycle. The Fork, the Witch, and the Worm: Eragon (Tales from Alagaesia #1): a follow-up book for The Inheritance Cycle; this is a collection of three stories after Eragon and Saphira left for the east. Dragon Rider: The Griffin’s Feather: the sequel to Dragon Rider; Ben, Firedrake, and friends go on an adventure to help save the Pegasus. Where the Crawdads Sing: A historical fiction set in North Carolina; focuses on Kya, a girl who lives in the marsh. Defiant Daughters: Christian Women of Conscience: a book that tells the stories of women who lived a life of faith; started in February. Between Me and You: a book that focuses on the story of a man and woman who are married, but things are strenuous. Each book had its pros and cons. My favorite book this month was probably Where the Crawdads Sing and my least favorite was probably The Fork, the Witch, and the Worm. 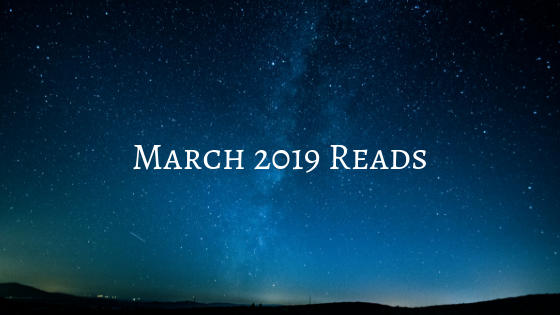 March was a good month for books, and hopefully April will be just as good.